The Ultranet is a $60.5 million online portal for teachers, students and parents in Victorian government schools. After years of build up, the Ultranet was officially launched on Monday 10th May and my school was in the first group of schools to come online. The first stage of the Ultranet allows students and teachers to create personal learning portfolios and collaborate with others across the state. Stage Two, to be released in Term Four will allow parents to log on and keep track of their child’s performance. It will also include features for teachers to plan curriculum and monitor and assess student performance. While the Ultranet is unique to Victoria, it is not dissimilar to other smaller scale online portals that schools around Australia and the world run independently. With increased accountabilities and controls appearing in various education departments, I would not be surprised to see an increase in Ultranet type portals in coming years. I completed the two-day Lead User training last week. This “train the trainer” course provided an overview of all the features of Stage One as well as discussions on how to implement the Ultranet in our school. After these two days, I’m still gathering my thoughts on the pros and cons of this new initiative but I thought I would share some initial thoughts. What do you think about the Ultranet? Please leave a comment and share your thoughts. It sounds like an interesting project and I hope it has positive effects on student learning. Sadly I think that any scheme like this that is a walled garden will not allow students the benefit of collaborating with the global peers. Mandating its use by teachers may not be enough by itself. Without enough support for the less tech savvy users it will suffer from a lack of “buy in” and self-sabotage that fell other ICT/learning initiatives. Having said all that… It has to start somewhere…and if some teachers just can’t cut it maybe Ultranet will have to change… or teachers may want to consider their teaching futures. Good luck and keep us posted, this may be a local system but it’s coming for all of us in one form or another. @ Michael, you must have good eyesight! Thanks for the comment. You’re right about the risk of self-sabotage but yes, we do have to start somewhere and hopefully my doubts about the Ultranet prove to be wrong! Will keep you posted! 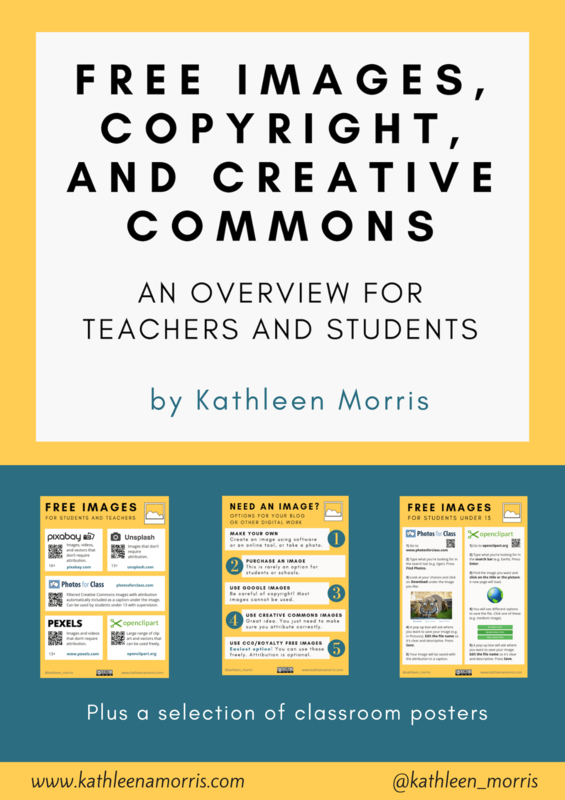 I like the idea of keeping parents involved this way, I think the idea of an eportfolio that follows students in one-easily-accessed place is very handy. I, like Michael, worry about how it will all play out. I hope that it surprises and impresses us with what it has in store. My misgivings are probably encapsulated in both “clear, purposeful, supportive ongoing professional development” and “glitches in many aspects”. Unless the state manages those two in particular, it won’t be as successful as it could be. Your Ultranet-brain has been ticking overtime! Some interesting and insightful observations and important considerations as we now begin to plan how to support and guide staff and students with this ‘knowledge management’ tool. 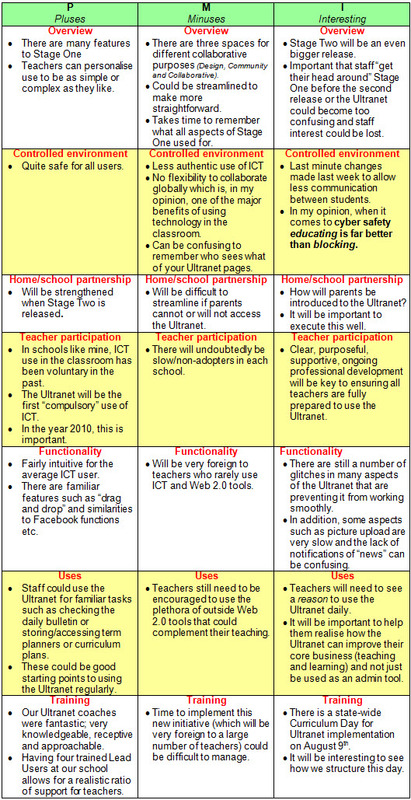 From my point of view, as one of the Ultranet Coaches, it will be interesting to see how the Ultranet is taken on and adapted differently by each school. I am also looking forward to the increased opportunity for teachers to collaborate and share their ideas and resouces beyond the walls of their own school, just as we are now. @ BookChook, professional development is something we’ll be discussing this week so hopefully we’ll be able to come up with a great plan! @ Erin, thanks for throwing your Ultranet Coach thoughts in! You have a better perspective than me because after the two days I find it hard to imagine more than Stage One so I can’t really think ‘big picture’ without seeing it all in operation. I agree that it will be interesting to see how teachers adopt the collaborative tools. Hopefully this is something that will be embraced. I also completed my Lead User training last week. I agree that this is huge for staff that aren’t tech savvy and have concerns about some of the glitches (Ultranet dropping in and out at all times of the day etc) and how these staff can be supported when there is really no time set aside to work one on one with them. Having said that, I am excited about the many features that the Ultranet has to offer and as long as they are willing to take feedback and make improvements I believe that it has the potential to be a great collaborative learning environment. @ Katie, I agree, the Ultranet has great potential so hopefully we’ll be able to get through a few teething problems and get all the staff enthused with its potential! @ Jeff, couldn’t agree more. I think this is a major flaw and I feel like it will be “pretending” to use web 2.0 in a way. 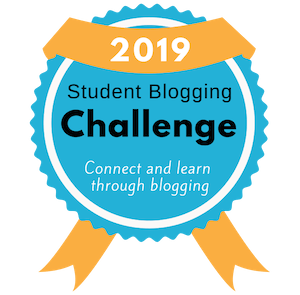 My students are already keen bloggers and enjoy collaborating with others around the world. I’m not sure what they could get out of the Ultranet and to tell you the truth my attitude towards the Ultranet is becoming more negative each day! Hi Jeff and Kath. I am a bit confused re “students will not be able to work directly with other students” as they will be able to do just that in Collaborative Learning Spaces. Whilst some of us have the luxury of working in schools led by forward-thinking professionals, a lot of teachers would have been beating their head against a brick wall for a long time, trying to convince Principals and School Councils that having students online, using Web 2.0 would not lead to court cases. Ultranet offers schools a platform that is secure and places a range of tools in one place for staff to utilise. I am sure that the product that we have now will change over time to meet the expectations of those of us that have greater experience with wikis and blogs, but offers a shared, common platform as a starting place for the majority of the teachers in the state. @ Erin, thanks for your comment. You’re right – students will be able to work together in Collaborative Learning Spaces however I’m really not sure why the government would support schools who are “not forward thinking” by encouraging a sheltered environment for collaboration. I recently wrote a post about why I think blogs should be open which explains it all. From a bigger picture view, I am against restrictive and closed online spaces (which Collaborative Spaces are) and, as I mentioned in the article, I think educators are doing their students a disservice if they do not or cannot instruct their students on appropriate online behaviours in an authentic environment. I feel I would be taking a backwards step if I went from blogging with a global audience (where every day I am astounded by the levels of engagement and learning that my students are experiencing) to working in a heavily restricted Collaborative Space. I am committed to teaching my students that that there is indeed a world outside of their neighbourhood and that world extends well beyond our state of Victoria. You mentioned that the Ultranet is a starting place for the majority of the teachers in the state. I think this is lowering the expectations for our teachers. Maybe my standards are too high but isn’t the general goal of the Education Department to strive for “best practice”? In my opinion, the Ultranet as it is now is not “best practice”. Maybe it would have been in 2005 but in 2010 it is not going to meet the needs of my students. Don’t get me wrong Kathleen, I agree with you but have in my travels seen the huge pedagogical gap for most to get to the point in their teaching that you are at. Ultranet will, hopefully, support more to move in what we clearly agree is the right direction for the future of education and our students. I wish that there were more teachers like yourself to set a positive example in all schools. Thanks for all of your thoughts behind the Ultranet. I’m a Lead User also and was not suprised on Aug 9 that the Ultranet crashed (luckily we were prepared for it)! I was running blogging sessions for teachers a few years ago and was impressed with the response from a small group of teachers willing to give it a go. With the introduction of the Ultranet I’ve seen so many teachers who are too scared to even give it a go. I feel for all the other Lead Users because we’ve got a tough job ahead of us. I can see that the Ultranet has many positives in collaboration for teachers but if the majority are too scared to log on I can’t see it being worthwhile. We’ll just keep doing our bit I guess and hope that others face this fear. @ Clare, thanks for your comment. I think it’s going to take quite a while to get everyone comfortable with a new way of doing things. We’re trying to drip-feed the Ultranet to our staff and so, far so good except for the fact that every PD we’ve ran since May has been affected by the Ultranet not working properly (or at all)….but that is another issue! Teach Like a Champion: A Guide for the 21st Century?